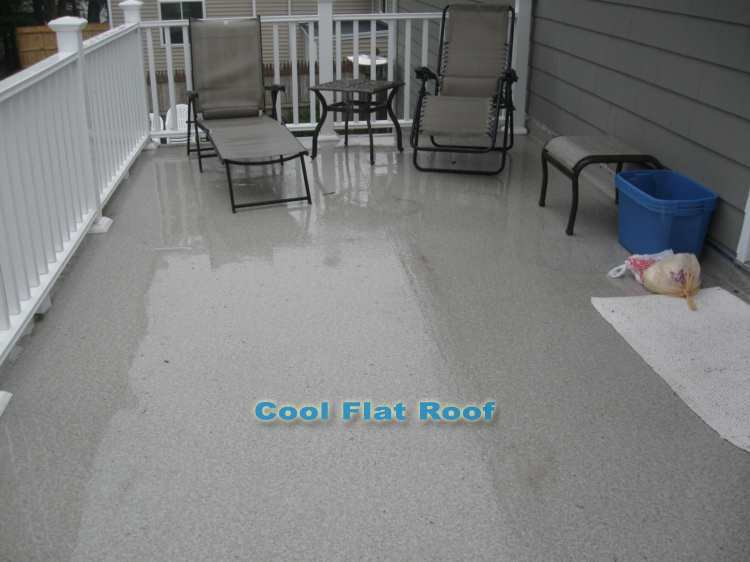 Roof Decks Leak Problems and Solutions – Many homes have an outside deck / patio over a living space, and so far, the solution to waterproof them was to install a rubber membrane roof and a wooden deck on slippers over the rubber. On some older roofs, instead of a rubber roof, a Tar / Built-up roofing material is used for waterproofing. The main problem with this assembly is leaks, which often occur within a few years of the roof deck’s installation. Often the seams on the roofing membrane pop open, or water starts to pool under the deck, and the only way for this water to drain is into your home. If you need to repair such a roof deck, you will have to take it apart completely to seal the seams or to redo the roof flashing, and then put everything back together. Another issue is the cost of such a roof deck (even without the high costs associated with roof repairs) – the rubber roof by itself is somewhat inexpensive, but when you add the cost of a pressure treated wood deck (a fiber decking, mahogany or some other premium deck is rather rare, and most people do choose to go with PT wood), your deck ends up costing a small fortune. Then, you also have to install and seal the railing posts. 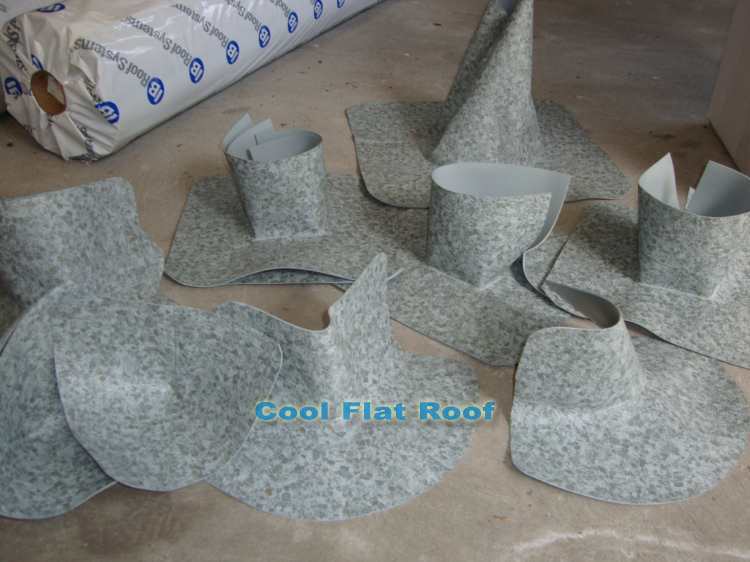 On a rubber roof, pieces of uncured flashing must be glued to the rubber roof and the post to make the post penetration watertight, and on a Tar / BUR roof, liquid tar or roof cement is used to seal around the post. Both rubber roof flashing and tar flashing around the post will begin to fail after 5-7 years, so once again to stop the leaks, you will have to disassemble the deck and repair the flashing. IB Roof Systems recognized the need for a long-lasting waterproofing membrane for roof decks, patios and balconies, and based on their excellent PVC roofing membrane, created a Deck Roofing product, which will last for decades, is easy to repair (if such need arises), and has a special, slip-resistant, beautiful surface. This makes it possible to walk on this surface, eliminating the need for a wooden deck over the membrane, and making the whole roof seamless and watertight. IB Deck Shield was created based on IB Roofs’ proven PVC roofing membrane, designed for flat roofs, and featuring hot air welded seams, which make membrane overlaps sealed permanently, ensuring a long-lasting watertight roof. An IB roofing membrane can withstand ponding water, and is an excellent choice for any flat roof. IB roofs also have a complete line of flashing accessories – inside and outside corner flashings, pipe flashing ranging in size from 1/4″ to over 12 inches, for extra wide exhaust pipes and furnace stacks. Because of fast and easy installation in all tight spots, any roof penetration can be flashed quickly and any installation defects are eliminated. IB took it’s existing PVC roof product (IB Flat Roof), and added a special surface to it, making it slip resistant, even when wet, and added a beautiful texture, which resembles small pebbles, often used as a swimming pool deck. All components of IB Deck Shield roof are color matching and will produce a uniform, great-looking final product. Because an IB Deck Shield is exposed to constant foot traffic, deck furniture, outside BBQ grills, etc., it must withstand all this abuse and last for many years without any leaks. To be able to do so, an IB deck Shield is installed over a dense, moisture resistant substrate – DensDeck, which is attached to the roof deck. Once DensDeck substrate is installed, all seams are taped and “plastered” with a special joint compound to provide a universal, smooth surface, to which the Deck Shield membrane is glued using either a water-based or solvent based adhesive (we use water based glue, as it is environmentally “safer” than a solvent based product). When a a joint compound cures, we apply a layer of IB water-based adhesive and lay down the IB Deck Shield membrane, which was previously aligned to be wrinkle free and to have exactly a 2″ overlap with the previous sheet of membrane. 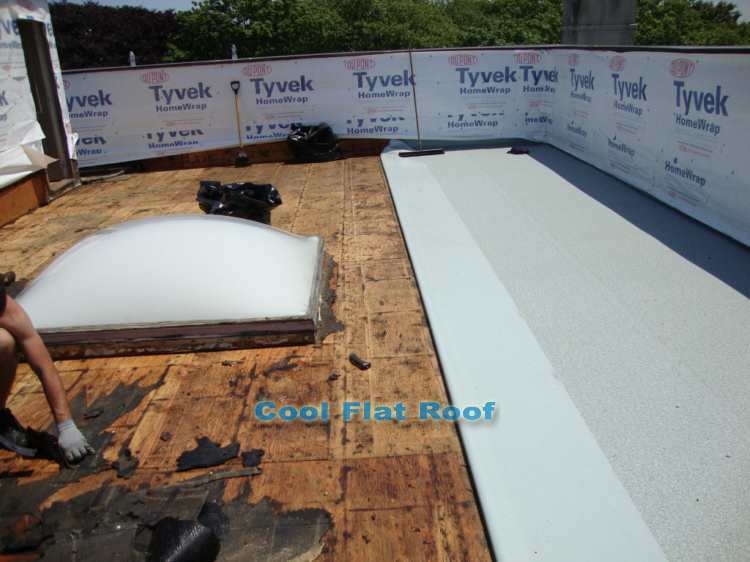 Once adhesive is applied and membrane is laid down, it is mechanically fastened at all roof to wall connections, but never in field. After a few minutes, when adhesive cures, all seams are welded and it’s time to install roof to wall flashing, as well as all pre-fabbed inside / outside corners, and all post penetrations. IB Roof manufactures special post flashings, which can either be pre-welded or split, and it is the choice of a contractor which one to use. We prefer to use split post flashings – although the split post flashing requires more welding, it is actually easier to install than a welded flashing, because when we order them, we specify the post size – usually 3 5/8″ x 3 5/8″ (a standard 4×4′ railing post). By contrast, a welded flashing sits pretty tight around the post, so it is rather difficult to pull it all the way down. Once all DensDeck is installed, all DeckShield is glued down, seams welded and all flashings are installed, the roof is complete, and now you have a durable, completely water-tight roof deck, where you can spend nice summer days, invite your friends over for BBQ, and not worry about roof leaks any more. IB DeckShield is VERY durable, and very resistant to puncture damage. Because it is glued to the DensDeck substrate, the surface under it is very hard and most sharp objects that fall on this roof will bounce off leaving very little or no damage – we accidentally dropped sharp tin snips; they just bounced off and did not cause any damage. Of course you want to be careful with your new roof and not drop any sharp objects purposely, but small accidents do happen, and you can be confident that IB DeckShield will withstand all normal wear and tear – foot traffic and most accidental drops, which would usually puncture a flat roof such as rubber roofs. If your roof is damaged – in most cases it should be leaking for a long time, as the membrane is glued to the substrate and even if some water gets in, it won’t be able to spread and leak inside your home. It is also very easy to repair an IB Deck Shield roof – a small patch of color-matching membrane will be welded over the damaged area, making the repair virtually invisible, unless looked at from close distance. An IB DeckShield roof will remain weldable for decades, just like other IB Flat roofing products. How Much Does IB DeckShield Cost to Install? IB DeckShield is a premium flat roofing product and it is rather expensive by itself. However, when you consider the alternative of a rubber roof with a PT wooden deck over it, IB DeckShield will usually be less expensive, as PT wood deck will add a significant amount to the total roof deck cost. Price of IB Deck Shield installation will also depend or roof difficulty, number of roof penetrations and whether the existing roof needs to be removed. In case of a roof removal, the roof deck must be installed in sections, and sealed at the end of each work day, to prevent roof leaks from overnight rains. A basic price to install IB DeckShield starts at $13-14 per sq. ft. (assuming that your roof deck is approximately 200-300 sq. ft., which is a typical size), and includes a 1/4″ DensDeck Substrate, with all joints sealed using joint compound, and up to 5 post flashing penetrations. All other flashing and penetration details will be priced, taking into account other aspects of your roof, and the project as a whole. Roof tear-off will be priced in the range of $300+ per 100 sq. ft. of roof area, plus cost of the dumpster. 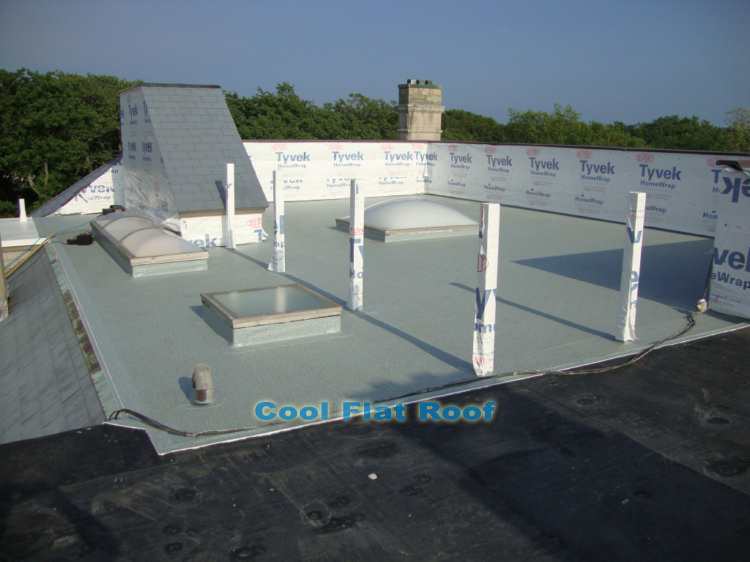 The reason for this price structure is as follows: Roof decks are usually rather small, but the tear off greatly intensifies the installation difficulty and slows down the overall process. Also, we separate dumpster fees, as on a small roof we would still need the smallest (10 or 15 yards) dumpster, which costs about $300. To give you an example – it took us about 5 days to complete the roof in the first picture on this page, with 4-5 guys working 8-10 hours per day. The roof size there is approximately 1200 sq. ft. So assume that 4-5 guys removed and installed about 240 sq. ft. of roof in 1 day. The pricing above is approximate and reflects a general price structure that we use for deck roofs installation in Massachusetts and the rest of New England states (Roofs in CT, RI, NH, ME and VT). We will price each roof deck separately, but this will provide you with pretty accurate pricing guidelines, so you would know how much to expect to pay for an IB DeckShield roof. As a comparison, a rubber roof would cost you $8-10 per sq. ft. plus the cost of PT wooden deck, which can range from $13-20 per sq. ft., often without the material costs. Roof deck installation using 80-mil IB PVC roof with a wooden deck over it. RoofDecks.org – general information about roofing materials, roof deck prices and installation methods of waterproofing products for roof decks, balconies and patios. Flat Roofing – informational resource about flat roofing materials – Learn about EPDM Rubber roofing, PVC and TPO roofs and Tar & Gravel, Modified Bitumen and other Built-Up roofs. www.RoofingCalculator.org – estimate roofing prices in your state for different roofing materials – asphalt shingles, metal roofs, and various flat roofing membranes. Learn how contractors price their roofs, as well as pros and cons of different roofing materials. Find out how to measure and estimate a roof using an extensive step-by-step roof estimating guide and roofing calculator software. Do you know of any installers in Denver, CO? I personally don’t, but contact IB Roofs, and they will put you in contact with local certified contractors. Or fill out this estimate form to get 3-4 local companies … though they may not be working with IB. 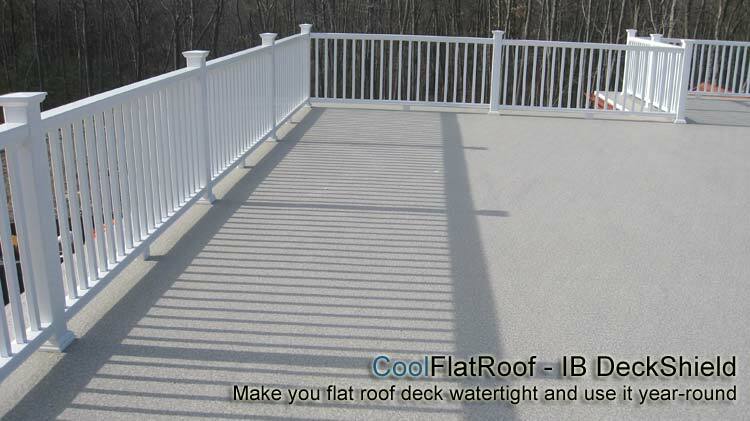 I need a company that installs IB Coolflat roof in the south jersey, 08753.Please contact. 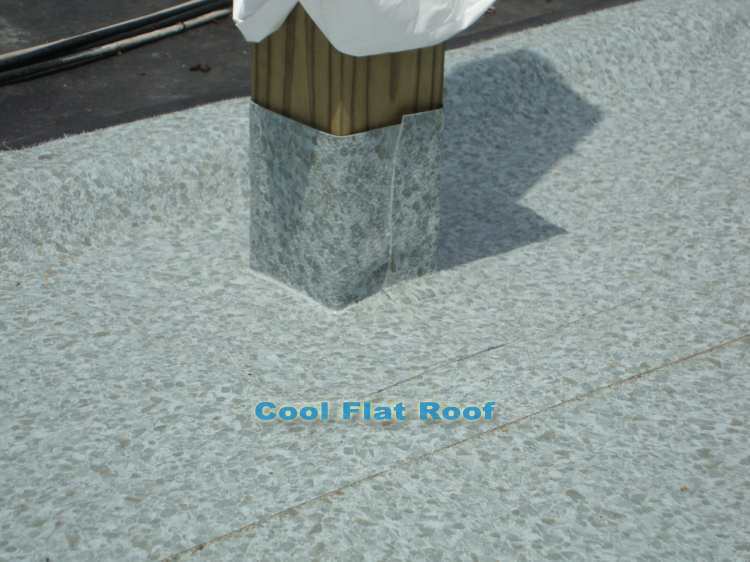 I need a company that installs IB Coolflat roof in the south jersey area. Please contact. Is this product available in Ontario, Canada? I have seen a product called Duradek advertised here and was wondering how that compares in quality to IB Deck Shield? It should be available. Call IB and see if they have approved contractors near you. Do you have contractors in Oklahoma city or nearby? We live in San Antonio and have areas of our two story home with flat areas. Would this material and installation hold up. Are there roofers that can install this system? Can this roof be done in Arizona? If so, do you have the name of a contractor? Do you have installers in the Sarasota Florida area? Do you know any IB deck installers in Minneapolis? hi, any contractor around north Virginia area? the roof deck of my house has water leaking problem. need somebody’s help. Do you have any installers in San Diego? Yes – contact IB – they will direct you to local approved contractors. Any installers in Raleigh NC area? Look for some in the Greenwood SC area that install IB Decking. Trying to decide on PVC roof with wood deck on top or IB Decking. We have a flat roof garage (1000 sq.ft.) with EPDM covering which is leaking. Do you know of IB Deck shield contractors in Indiana? I have a 25×25 roof deck(above a 2 car garage). We currently have a rubber roof base on which we had vortex super sealer and binding agent, plus sprayed on vortex industrial liner( 3/16 thick ) installed about 5 years ago that is now cracking and breaking off everywhere. There seems to be no allowance for expansion and shrinking due to weather condition. Is your product recommendable for my deck located in Westchester, NY? If so, please let me know how to proceed to have a qualified contractor provide an estimate. I wanted to speak to you about the IB Deck Shield product. I have an old, rotting wooden deck and I want to replace on a 3rd floor roof. The IB Deck Shield may be the perfect alternative to building a deck. Please contact me as soon as possible to discuss. Hello, do you have a qualified IB Deck shield sales rep or installer in the Salt Lake City, UT area? This looks like what I need for my walkout terrace that is over the garage. Thank you! I am looking for roofing contractors in the KY/Tenn area who handles roof/patios. Thank you for any help you can offer. I would like to see some roof deck material samples of a brown color and different textures. looking for someone in the suburbs of Chicago to install your material (IB DECK SHIELD on a roof top balcony. Please send specifications / product information / installation instructions and list of qualified installers in Arlington, Virginia region. Here is contact info of local IB Roof sales rep and regional manager. Call either one and they will connect you to local approved installers of IB Roof products. Do you have vendors in the Portland Oregon area? It’s funny that you can’t find local installers – IB Roofs is from Eugene, OR, so your area has the most approved contractors .. Call him at 510-703-4555, and ask for list of local approved installers. He will give you a few names / numbers. Tell him Leo from Cool Flat Roof sent you. Good luck, and let me know how it worked out for you. I need to put a waterproof deck material on a flat roof over living space. The area is roughly 20 by 6. Have you installers in the 12815 zipcode, an hour north of Albany NY? Do you know of any providers/installers in Colorado? Roof of my garage is my deck. It has black rubber flooring with no leaks. Was put in 8 years ago and in great condition.have been covering it with outdoor carpeting but tired of replacing carpet. Area is 26 feet by 26 feet. Would like an estimate. Sounds like this would be quite expensive! I’m in Montana, and curious how this system holds up against snow shoveling? I’d like to have a flat deck over the garage of the house I’m planning, and looking for a good roofing/deck system. Please fill out our online estimate form and we will get in touch with you. Free estimates? We live in a house built in 1903 that has membrane (?) Roofing done in 60s on wrap- around porch . It has developed leaks. What is best solution? A 50-mil white IB PVC roof would be perfect and most economical roof for you. If you need an estimate, fill out our Quote Request Form and we will get in touch with you. Do you have approved contractors in SW Florida? I am building across the street from the gulf. Are you approved by Miami Dade Hurricane Codes? Thank you! Can this be installed on an upper deck that is pressure treated wood to waterproof a below deck or is this for only actual existing roofs? Will this withstand snow and snow removal with a plastic shovel? Is this something my contractor can purchase and install? 2) It will withstand snow / ice and you can clean it with plastic shovel. I’m looking to install a flat roof on a section that is a right triangular shape (10’x26′ = 130SF). The residence is in Rochester, NY. Looks like you are just in New England. If correct, can I install your system myself? I am the residence owner, fairly experienced with renovations and new construction (journeyman level skills), including work as a roofer while in college. Also wonder about mounting the railing posts on the sides of the deck structure, thus avoiding any penetrations to the surface material. Pls comment on that idea. Were you able to do this project? I too reside in Rochester, NY and I want to replace the flat section of my roof with an IB roof. I just have not been able to find any companies locally that work with this material. If you have any additional information, could you send it this way? Here is local IB Roof rep’s info – he will connect you with local approved contractors. Please share this website on facebook or google plus or something, if you don’t mind. Sorry for late reply, but I hope this helps. You can install this product yourself with some practice first. BUT … you can’t buy it as a homeowners. So your options are to go to local roofing supply and buying other PVC material … most likely you will find Carlisle or Versico that you as homeowner (or contractor friend, or pretend to be contractor) will help you buy. RAILINGS: Putting railing on the sides is wise. Waterproofing penetrations without proper skill and proper flashing accessories can be a nightmare – the fewer penetrations, the better. You can do mechanically attached system – just make sure you mark your deck rafters and place all screws BETWEEN those marked lines, not under. Also, here is local IB Roof rep’s info – he will connect you with local approved contractors if you decide to hire a roofer instead of DIY. Do you have any vendors/installers in Northern California for this product? Thanks. I am building new wall and roof over an existing heavy duty deck which will become my new enclosed Breakfast Room. I want to build a deck over this new breakfast room I am creating. The new Deck is to be 22’L X 8’W. The backside is against 8″ lapped hardie board. the right side will be attached to and existing roof slopping 8/12 twowars the right end of the proposed deck. House is Colonial and the deck railing is much like the white railing in one of your project pictures. What slope can I build into the roof and how to attache the railing posts? I need diagramatic instructions so I can use an IB type of roofing. do you have a contractor in tampa/saint pete, florida area? How well do these IB PVC roof hold up to intense sun exposure? I have a flat roof on my garage and over a patio. It is the old tar and gravel. I want to replace them with a cool roof type but want to ensure that degredation from the intense heat will not be rapid. The house is in Redlands, CA which averages 100 F during the summer. Do you have any recommendations for excellent roofing companies in San Bernardino or Riverside counties? Hello do you know if there is a contractor in montana that is qualified installer of your product? Please advise on the best contractors in northwestern Washington for your IB deck shield cool flat roofing system. 09249, 98260, 98206, 98101 ZIP CODES. Is Jorve Roofing of Seattle a qualified and experienced installer of your product? Hello, is it okay to install on the balcony and use tile instead of wood flooring ? Also, what kind of glue are u using ? How long can the materials last ?